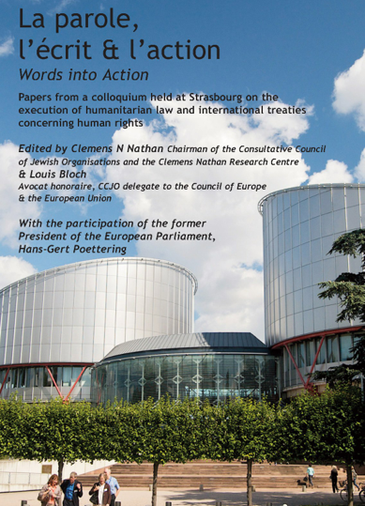 In September 2010, the CCJO and the Clemens Nathan Research Centre organised a colloquium in Strasbourg on La parole, l’écrit et l’action. Eminent professors of international law, President Hans-Gert Poettering and Mme Catherine Trautmann, members of the European Parliament and key figures in European institutions and in the International Committee of the Red Cross, addressed the issue of how to compel a State to uphold the commitments it has made with respect to Human Rights and Humanitarian Law. This book brings together those papers. At the same event a presentation of the René Cassin medal was made to Hans-Gert Poettering by Clemens Nathan.